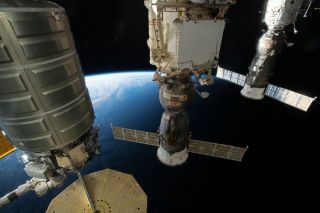 Two spacecraft sit attached to the Internatioanl Space Station over the Strait of Gibraltar. Down here on Earth, the weather can always turn nasty. In addition, there's traffic and bills and gravity and a bitter election season drawing to a close. If the stresses of life are starting to fry your nerves, might we recommend the soothing balm of a video fly-though of the International Space Station, set to an ultra-smooth saxophone solo and deep, meditative bass tones. In the new video, posted by NASA on Thursday (Oct. 27), viewers take a visual tour of the station, with only a calming soundtrack as their guide. No crew members are visible. The camera floats weightlessly through the passageways, as if drifting through water. Earthly cares melt away. Awe washes over you, as you meditate on the house that humans have built in space. The ultra-high definition (4K) video was made by a video service provider called Harmonic. The video description says it was shot "using a fisheye lens for extreme focus and depth of field." In September 2015, NASA's Marshall Space Flight Center in Huntsville, Alabama, announced a partnership with Harmonic to create NASA TV UHD, an UHD video channel. In December 2015, NASA and Harmonic partnered to deliver UHD footage of the launch of an Atlas V rocket carrying a Cygnus cargo spacecraft. Details about how to get the channel can be found here. Many of NASA's UHD video can be found on the agency's website or its YouTube channel, or through Harmonic's YouTube channel. The video description does not say who shot the footage. The European Space Agency released a virtual tour of the station earlier this year, combining existing footage with new animations. That tour can also be viewed in 3D.